In addition to the detailed locations provided by the FSQ telemetry, Flying Squirrel #2 also sent WSPR messages 4 times an hour. WSPR is a very weak signal digital mode, often decoding signals below the noise (i.e. you can’t even hear the signal with your ears). The WSPR mode sends a position as Maidenhead Gris squares, which is a very rough position of the sender. FS2 used the 6-digit grid locator which will locate the position to a, roughly 5×7 mile grid square. The purpose of WSPR on FS2 was to give an approximate location, that had good chances of being received by a large network of stations already listening for WSPR signals. Had we lost track of the balloon for a time on FSQ , WSPR would allow the ground stations to get into the neighborhood of the balloon and re-acquire FSQ. As it turned out the FSQ performed really well and we never lost contact until the end when it was clear the balloon returned to ground. However, it is worth reviewing how WSPR performed. The map above shows that a number of stations heard FS2 and reported its position. All of the position reports were significantly to the east, the closest being east Texas. FS2 was heard as far away as Jacksonville FL. 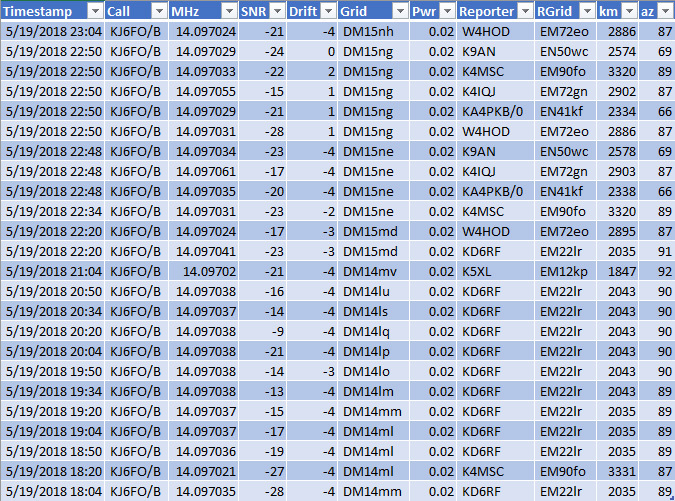 The table above shows that certain stations received the FS2 WSPR multiple times. Also worth noting is that many of the reception reports indicated receive signals strengths at -20db and above. WSPR easily can decode to -28 and below, so the signals seem to have been strong on the whole. I do wonder why more stations, especially stations within line of sight did not pick up the balloon. Radio propagation conditions were not good at the time we flew. It had been approximately 6 days with no sunspot activity and there was some possibility of space weather caused disturbances. That may explain the lack of reports, but it is impressive that a 20mw signal was heard on the far side of the US! I am interested in the reliability you are getting with the FSQ Telemetry. I am using the JTencode https://github.com/etherkit/JTEncode library for arduino with a Si5351 running up in the 2 meter band. If I transmit ever 20 seconds I get maybe 1 message into the telemetry file per 5 minutes. I have not tried your code yet but wondering about your performance, I know you mentioned also using the text output to reconstruct your flight messages. Thanks for the great blog, I just discovered, any plans for more balloons? FS1 & FS2 operated on HF bands (10M & 20M respectively). The performance of FSQ & the small signal from the Si5351 board (20mw) was very good. FS1 did not have GPS, so I can only guess where it went. FS1 was tracked for roughly 4 hours and predictsions had it going down towards the Mexican border along the Salton Sea. FS2 did have GPS data and I was tracking it from my chase car (Ground Squirrel) from 60 Miles away, at times, and still had great signal strength until it lost altitude and probably went behind the terrain. My Home station near, Riverside, picked up a number of transmissions when the balloon was at it highest point. That was also around 60 miles. Had the balloon gone higher, I thing the home station would have tracked it much further out. Of all the packets sent, only a few were lost. We had 4 receivers running for FS2. All 4 lost one transmission. I suspect that transmission did not happen for one reason or another. There were about 5 other transmissions that we lost some part of the data, but those transmissions were mostly intact.It is possible QRM may have caused this because transmissions following these were solid. One or two transmissions were lost at the very end after the balloon was going to ground near the Goldstone arrays in Ft Irwin. At the time I was on Hwy 127 North of baker (as close as I could get) and heard it well until the end. The few transmission I missed from my chase car (Icom 706 and a ham stick on the back of a pick up) were picked up by two other recievers, one a home station and the other another chase vehicle that went off west of Ft Irwin. In short FSQ worked amazingly well! I have had some problems with getting the Si5351 board to be stable above 10M. It wants to drift in frequency at VHF and the narrow bandwidths of WSPR & FSQ notice this drift badly. I am not sure if that was just because my test set up on the bench, did not have a good SWR match. I do know the si5351 chip is sensitive to changes in heat, more so at VHF. I would love to know how to solve that problem.